The Glock is an excellent handgun straight from the factory, but its massive popularity has produced a vast array of aftermarket parts. The magazine is no exception, however, finding a magazine that improves OEM performance while being affordable is tough. Here, we’ll examine why it’s worth upgrading, what factors you should consider, and run down the top aftermarket mags for the Glock. How Do Aftermarket Magazines Compare to OEM Mags? If you’re an older gun owner, you might remember the days when aftermarket magazines had a reputation for being, well, awful. Many experienced gun owners neglect aftermarket magazines to this day, not realizing that a wealth of new brands—and older brands, too—have flooded the market with significantly better magazines. For one thing, you’ll often get an improved grip, extra round capacity, a pinky rest, and much more. Durability and performance can also be better than factory mags. Not only do they often offer higher reliability but choosing carefully can net you a magazine cheaper than factory mags. Of course, you need to know what you should look for, so read on. ​When it comes to self-defense, you need to be ready for anything. 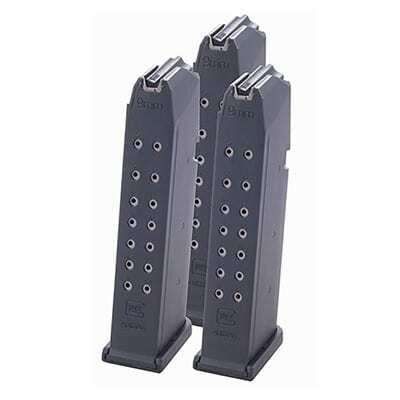 With a standard Glock magazine, you’ve got a set number of rounds. It may very well be possible or even likely that you’ll survive an unfortunate encounter, but why take the risk? If it’s possible for you to carry extra rounds to protect yourself or your family, then you absolutely should do so. ​If you have one magazine, there’s one way to clear a malfunction. You need to eject, clear, and reset your mag. Now, if you’re practicing on the range or competitively, it’s annoying. If you’re in an encounter situation, it means you have a worthless hunk of metal instead of an instrument of self-defense. ​Let’s say you have two magazines, one a standard Glock magazine with six rounds and another an extended magazine. Wouldn’t it be nice to have the option to switch them out to use whatever the occasion calls for? Don’t overlook the fact that an extra mag doesn’t have to be the same as your active mag. ​You don’t need to stick with a standard Glock mag capacity when upgrading. One or two bullets might not sound like much, but if you need one more bullet and don’t have it in an emergency, you’ll sure wish you did. ​Ideally, an aftermarket magazine should improve performance, but at a bare minimum, it should be as reliable as OEM magazines. After all, what’s the point in an aftermarket magazine that might give you an extra bullet but doesn’t feed properly? ​Some aftermarket mags greatly improve the grip surface or add extra room to rest the pinky finger. This can improve your accuracy. ​Your budget is your own, but one of the key improvements to aftermarket magazines over the years has been the fact that you can often get a better magazine for cheaper than a factory magazine. In this regard, the magazine you get should be competitively priced and offer great value at that price point. Now that you know what to look for to find your dream aftermarket Glock magazine, let’s take a look at some of the best products on the market. We’ll examine their key features, assess their value, and give you a bottom line that summarizes what sort of consumer would prefer that particular mag. Let’s start off with a factory Glock 9mm magazine, as that should be our baseline for whether or not the other brands improve upon a stock design. Not only that, it’s worth noting that a Glock brand magazine is actually quite nice and you’ll remember that we strongly recommend having backups. Even if you’re not interested in widening your horizons with another manufacturer’s magazine, it’s absolutely worth having some standard Glock magazines handy. The factory Glock magazine comes with a round count indicator on the mag’s rear, which is helpful to know when you’ll need to reload. With a capacity of ten rounds, it provides a solid number of shots. Feeding is smooth and jams are rare, as you’d expect from a Glock product that’s become a world-famous standard. That said, jams will happen on the rare occasion. Maintenance is simple and the product is lightweight. It is made from a durable polymer that’s both comfortable and strong, with a basic black finish. Overall, it’s nothing particularly special and won’t extend the number of shots you can take past ten or improve the quality of your grip versus what you’re already using. But it is a reliable standard and you should already be familiar with how well it operates. It should last a long time and be dependable when you need it most. Plus, you’ll be very familiar with your backup magazine if it’s the same one you’ve been using for a long time, anyway. 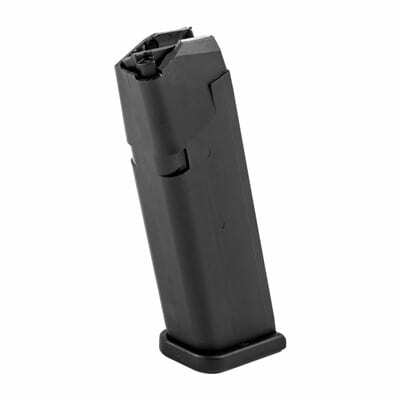 For those who prefer to stick with Glock, the ten round, OEM magazine is an excellent choice for backups. It’s durable, easy to operate, and reliable. Pick up a spare for when you truly need it! Once again, a Glock magazine is a standard around the world for a great reason: they’re reliable, easy to use, and durable. The Glock name on any product makes it dependable, and magazines are no different. 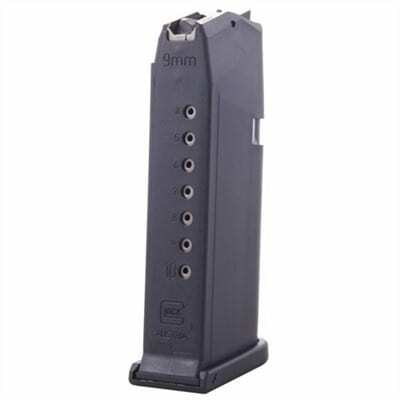 This magazine for the Glock 19 also grants a ten round capacity for a healthy number of shots per mag. If you lose track, it includes a round count indicator on the rear which is easy and convenient. Durability is excellent, as it’s built from a high-quality polymer with a black finish. There are more durable materials out there, but polymer is certainly rugged and the use of this material helps keep the grip comfortable and lightweight. It is a comfortable magazine that doesn’t weigh you down and improves performance by keeping your focus on your target. You won’t encounter jams often, as they are quite rare with a Glock magazine. They are also very easy to maintain, with simple quality parts and design. Overall, it’s an excellent option for those who don’t want to venture beyond Glock but do want a backup magazine or two, which we very strongly recommend. One great advantage to having a backup magazine that’s the same as your standard active magazine is that you won’t need to worry about adapting to another type on the fly when it really matters. Of course, we recommend that you be fully familiar with any magazine you own, but it would certainly be better to have your backup be a product that you’re used to rather than a spare that is not what you normally use. 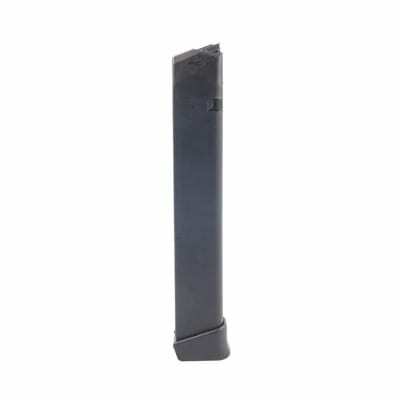 If you want extra magazines—and you should—and don’t want to experiment with aftermarket magazines, stock up on Glock’s own Model 19 9mm magazine, which is dependable, comfortable, and durable. Doesn’t Offer Marked Grip Improvements Over Factory Magazines. Moving beyond just what Glock creates, we have the Magpul Pmag 17 GI9 9x9 Magazine for Glock 17, which brings several enhancements, as well as a great price. First, Magpul creates their magazines from a proprietary polymer which no one else uses. This makes their magazines not only especially durable, but also lightweight thanks to the material type. But they don’t stop there. They add reinforcement to the feed lips and a much higher-quality, stainless-steel spring, as well as a highly visible anti-tilt follower. All of these added features ensure much more reliable feeding. You know the factory Glock mag rarely has feeding issues, but how would you like to make them so rare that you forget it’s a problem at all? A simple, push-button release on the mag’s floorplate allows you to disassemble the magazine and you won’t need tools to accomplish this. This plate also features a pen dot matrix so you can mark and identify your magazines. It will drop freely and clearly whenever it’s released whether empty or loaded. Overall, all these features and functions operate with exceptional smoothness and ensure that you’ll have minimal or no operational problems. The grip itself doesn’t offer any marked improvements on the original design, but it is comfortable to hold thanks to the polymer design, with slightly better traction than the factory magazines. Lastly, all of this comes in at an excellent price, making it a prime choice for anyone who wants to explore other magazines but not spend an arm and a leg. For those who’d like to try other magazines, Magpul creates a product that’s more than just enticing, with many improved features and exceptional reliability at a price that’s hard to pass up. If you thought our entries were sounding a little traditional, hold your horses and check out the Elite Tactical Systems Group’s Translucent Magazine For Glock, which—as the name suggests—offers a translucent design. This isn’t some marketing gimmick or a throwback to retro ‘90s gadget design, but a fully brilliant product with tons of great features. First, you probably guessed it, a translucent design gives you a clear view of your round count at a glance. This works very well in practice and is much faster than a round count indicator. Also, don’t think that translucency means compromised quality, as it is built from a rugged polymer that’s at least on par with the stock polymer Glock offers. Additionally, this polymer has been treated to withstand some insane conditions. Elite Tactical has tested their magazines by dropping them from an eight-foot height, fully loaded, without suffering cracks or breaks. They’ve subjected them to -60 F freezes and 180 F infernos for extended periods, only to have them function perfectly after exposure. Extensive UV exposure won’t make the magazine brittle and chemical resistance to fuels and cleaners rounds out the tank-like construction. But how does it perform? Smooth as butter. You’ll have a hard time encountering jams, as Elite Tactical’s magazines have been subjected to several thousand rounds without failure. Additionally, it is drop-free, provides an easy disassembly, and the polymer grip is comfortable. Overall, if you’re open to something different, this magazine provides an excellent set of features and a durable design that should definitely have a place in your arsenal. With a wide suite of unique features and a highly-efficient transparent design to determine your remaining round count, this magazine is a powerhouse that every Glock owner should at least try out. With a capacity of 33 rounds, this magazine is excellent for competitive shooting or for anyone who would like their Glock to have the capacity you’ll get from an AR-15. While obviously not suited for concealed carry, it does provide an exceptional number of rounds in a slim package. 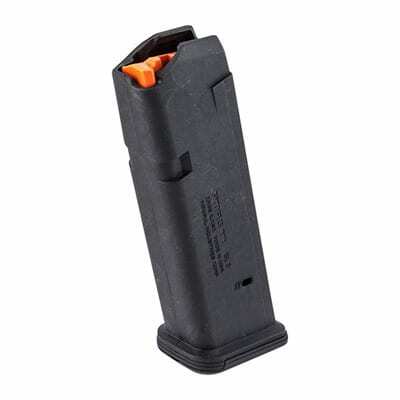 Having a spare magazine with 33 rounds offers a substantial and fast option for quickly loading way more rounds than you would with a smaller magazine or manual reloading without a spare. Made from high-quality polymer, as all Glock magazines are, it is durable and comfortable. This is absolutely key with a larger magazine, as the added heft and length require a sturdy hold. Additionally, the simple inner design of more basic Glock magazines has been retained, meaning that even though you’ll get way more rounds, it remains simple and easy to clean or disassemble. Lastly, we like that you’ll have the option of using this magazine with many other guns. For example, it could be used with a Ruger PC Carbine. 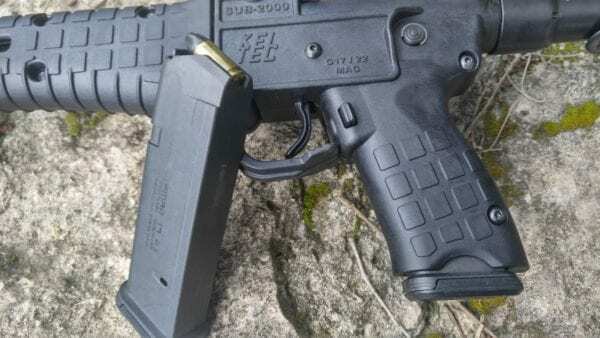 Of course, you’ll need adapters for use with other guns, but with a 33-round magazine, this starts to make a lot of sense, as you can stock up on spare magazines you can use for more than just your Glock! Overall, if you’re looking for a “big stick” magazine, sticking with Glock offers the reliability you know and trust, with a healthy amount of rounds. Plus, Glock asks a very reasonable price. We can’t stress enough the importance of having spare magazines for the unfortunate scenario that your existing magazine fails and you absolutely need protection. 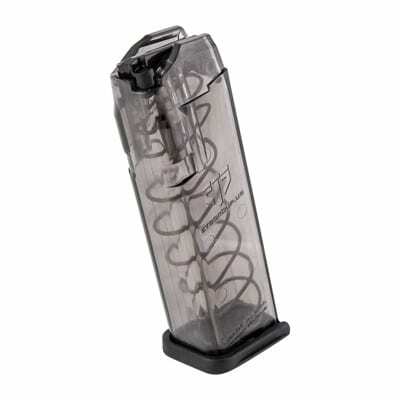 Spare magazines come in a range of capacities, some with unique features such as a transparent design to quickly count your bullets. Use our guide to determine what suits your needs before reading our reviews and you’ll be on your way to a safer carry.